"Total Lunar Eclipse on Winter Solstice 2" This very special total lunar eclipse was photographed on 12-20-2010 in the Tahoe Donner area of Truckee, CA. CLICK HERE to view print purchasing options or to license, download, and use the image right now. Wow, this image has gone viral and has quickly become the most viewed image on my website. A big THANK YOU to everyone who shared it or "liked" it. Photographed at 11:52 pm pacific, on a Canon 5D Mark II with a 100-400 lens set to 400mm. 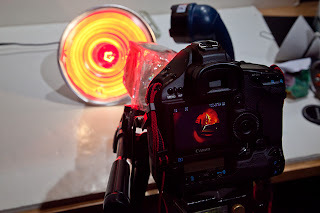 The camera was on a tripod, using mirror lock up and a shutter release cable. Settings were ISO 800, aperture set to f16, and it was a 4 second exposure. I used a flash set to manual, full power, to light up the snowy pine tree a bit. Processed with Adobe Raw, with minimal and normal adjustments, the eclipsed moon really was that red. Tip: I found that any exposure longer than 4 seconds did not work well. The moon moved too much and it looked blurry. If you have any other questions about the photo, please feel free to ask! Beauty at the Bottom - What is it? The story. And a bit of "how to". "Beauty at the Bottom: Red Wine 2"
The above photograph is one of my best sellers of all time. When people view it, they either know exactly what it is and smile big, or they ask "what is that?" If you need a little help, think of the view your tonsils would get if you took a big swig straight out of your favorite wine bottle while watching television. Still confused? What you are looking at is a red wine bottle tilted on it's side with a little bit of the beverage still in it. The camera lens is small and is looking right down inside the mouth of the bottle. For this shot, a television behind the bottle provides the main light source, creating a magical colorful kaleidoscope-like view of a magical beverage. It all started back in 1997 when I moved to South Lake Tahoe for a winter to live with my sister and to work as a photographer at Heavenly Ski Resort. When I first moved and arrived at her home in my car filled with all my belongings (not much), she was out of town so I had the place to myself for a couple days. I didn't know anyone in town yet so after I settled in, I picked up a 6 pack of beer and turned on the TV. After about the fourth one, for some reason I looked down inside the almost empty bottle. I saw the light from the television dancing around, reflecting off the glass and liquid, creating psychedelic colors I had to capture. That brings us to the "how". Most of the beer and wine photos in the series were shot in 2002 on 35mm Fuji Velvia slide film with my Olympus OM-1. Most of the new tequila photos were shot on my Canon 1Ds Mark III, a digital camera. But the one thing all the photos in this series have in common, and the big secret, is the lens I used. It is an old Quantaray macro lens that my Grandfather gave me, 55mm 1:3 with an Olympus mount. I now own an adaptor for the lens so I can use it on my Canon digital cameras. The thing that makes this lens work is the size of the glass on it, which is about the size of a quarter. It butts up perfectly with the mouth of the bottle and I can photograph down inside it. All of the 2002 and older photos in this series were photographed with a television behind the bottle to provide light and color. The new ones have a variety of backgrounds like poster board, computer monitor, fire, and snow with a variety of lighting types. Pictures are worth a thousand words so here's a few of the set up. Photograph using an El Ultimo Agave tequila bottle. CLICK HERE to view the result of this set up. 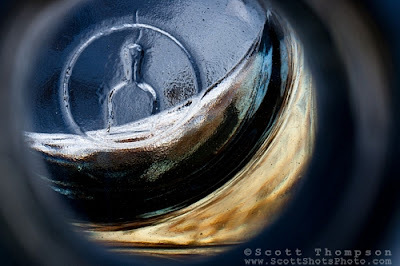 Photograph using a Fortaleza tequila bottle. 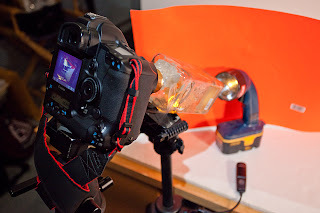 CLICK HERE to view the result of this set up. Photograph using a Corralejo tequila bottle. CLICK HERE to view the result of this set up. As you can see in the bottom example, I use two tripods for these photos. The exposures vary and can be anywhere from a fraction of a second to thirty seconds long. 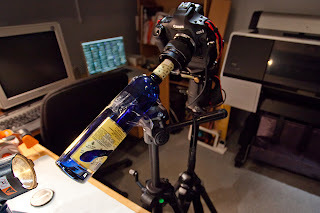 Taping the bottle to a second tripod or stabilizing it by some other means is a must if you want sharp photos. I also use mirror lock up and a shutter release cable for even less camera shake and therefore sharper photos. The aperture settings also vary as different depth of fields can create a very different look to the same bottle and setup. "Beauty at the Bottom: Tequila 8"
Most of the backgrounds and lighting I use are all about getting a certain color I want. But the image above is a little different. Casa Noble Tequila is an organic tequila, so that inspired me to use organic lighting and background colors. This one was shot outside using natural sun light and some snow covered rocks behind the bottle were used to add a bit of color to the light blue bottle. So, there's a bit about some of my most fun images that work great as conversation pieces. I hope you enjoy the photos and the story. If you have any questions about them, please post a comment below and ask. Here's a slideshow of the whole series, CHEERS! For purchasing information, please view the "Beauty at the Bottom" gallery and click on individual images. Available as large fine art prints, gift items, and as stock photography. 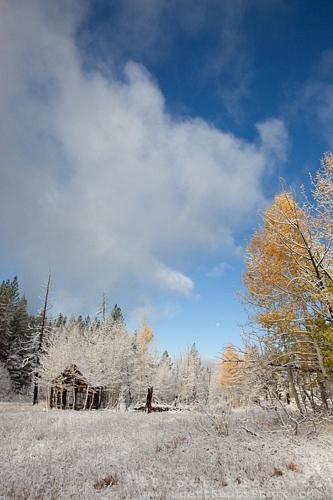 Fall Color Photography in the Tahoe and Truckee Area. "Shack near Brockway Summit 2" - This old shack was photographed along Hwy 267 near Brockway Summit, CA on a snowy fall morning. 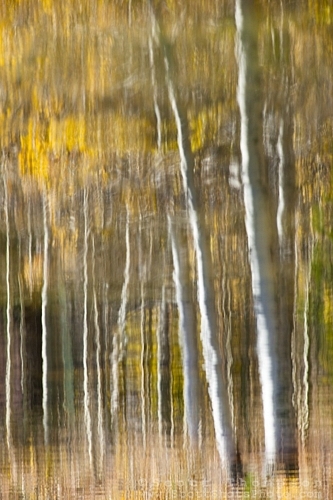 "Aspen Reflection on Water 4" - This is a photograph of an aspen reflection on the surface of Marlette Lake. 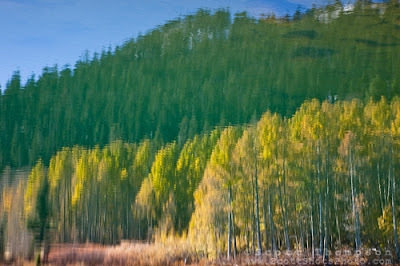 "Aspen Reflection on Water 3" - This is a photograph of an aspen reflection on the surface of Marlette Lake. 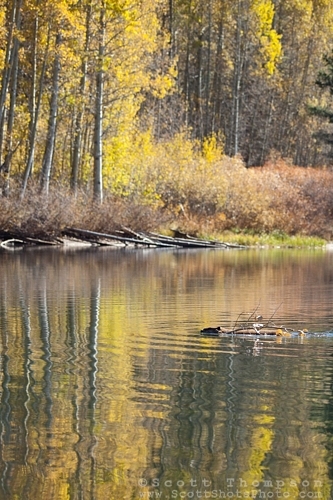 "Beaver at Marlette Lake 1" - This busy beaver was photographed moving a piece of aspen at Marlette Lake, Nevada. 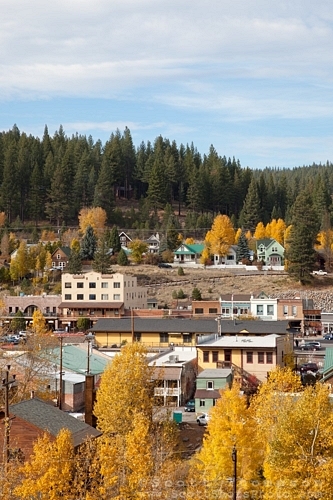 "Downtown Truckee in the Fall 2" - This is a photograph of homes and buildings in Downtown Truckee, CA in the fall. 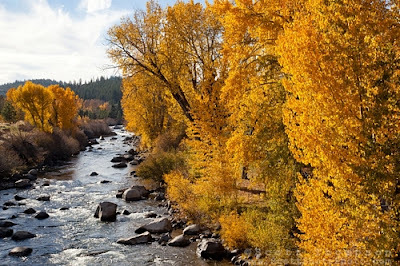 "Truckee River in Autumn 2" - These cottonwood trees were photographed in autumn at the Truckee River in Downtown Truckee, CA. All in all, I've had a pretty good fall photography season, and there's still a little bit left. We're expecting some bad weather later this weekend so I may have to get out again tomorrow before it all gets blown away until next year. The photographs above are available as fine art prints, gift items, and as stock photography. Please see www.ScottShotsPhoto.com for more info. There is a magical art event that occurs in North Tahoe every year and I have been lucky to photograph it the last two years. Trails and Vistas is a collaboration of visual art, musicians, performers, and mother nature. It is currently my favorite art event in the Tahoe area. Only a few photographers are allowed access each year. I really don't have much advice to offer photographing this event since cameras aren't allowed for the general public, you probably won't be shooting this one. The organizers want you to be fully immersed in the art, performances and beautiful scenery. I'll keep this post short and share a few of my favorite photos from the events. These images are available as fine art prints and greeting cards. 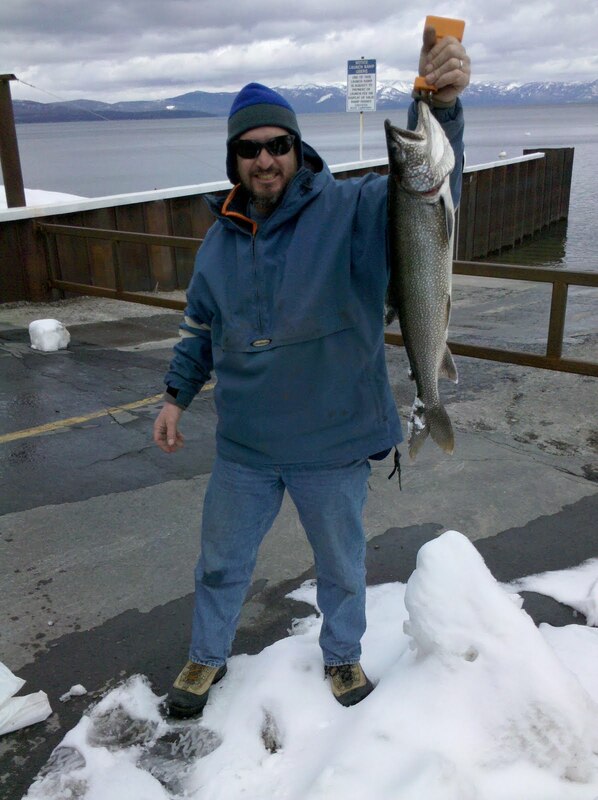 How my Motorola Droid smart phone makes me a better photographer. Google Maps- I feel like I have a helicopter's view of what's around me when 4x4ing the Tahoe trails. "Oh, there's a small lake right over there I didn't know about and would have never seen from the trail!" I don't always get reception out there but I am often surprised at how often I do. Maps (-) - This app lets you view and save maps when you do have reception, then you can bring up that map when you don't have reception. Bye bye paper maps. Google Sky Map- You can judge where the sun and moon will rise long before they do. Great for picking out a location when shooting the sunrise or moonrise. I feel like I can look into the future. MoonPhase- A widget that shows what phase the moon will be on every day for the next month. Great for planning full moon shoots. SunMoon- Computes the rise and set times for the sun and moon based on your gps location. Another great tool for shooting the sunrise, moonrise, and sunset. The Weather Channel app - 10 day, 36 hour, and hourly local and far away forecasts in my pocket. Many benefits to this one. DroidLight- LED flashlight app. I've gone out on hikes thinking I'll be back before sunset. Then I decided to shoot the sunset. This one has helped me get back to my truck when I didn't plan ahead properly. ScannerRadio- Police and Fire scanner. I actually don't use this one as the closest city on the app to me is Reno. But I see how it could be a great tool for photo journalists looking to be first on a scene. SmartPark- You can tag the location of your car. This is great when 4x4ing way out there and then hiking way away from your vehicle. Google Translate and aCurrency- Great while traveling. Know what you're saying and spending while shooting in far away lands. Also, if you have any apps to add to the list, I'd love to hear about them, iphone or Android. Please leave a comment. Self Portrait shot with a Motorola Droid. This last Sunday, May 2, 2010, I was driving back home from Mammoth Ski Resort and I realized that I had time to stop at Mono Lake and get some photos of the tufa towers. I had been wanting to shoot this area for years but I'm usually in a hurry when driving by. This weekend wasn't supposed to be a photo trip but I got lucky and made it one. 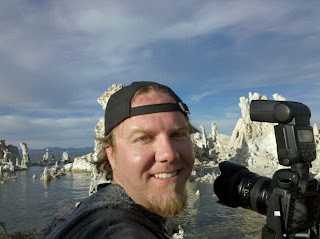 I had a great afternoon and evening running around like a kid in a candy store shooting the giant tufa towers. There are plenty of trails around the tufas, and there are signs posted to not climb on them or remove pieces. I saw why. There were about ten other photographers out there but I saw one of them try to climb up a tufa tower to get a better angle. I was thinking "that's lame" when all of a sudden a chunk the size of small ice chest broke off and came crashing down on the guy. He was obviously very embarrassed but he was proud he didn't get hurt or break his camera. I wasn't impressed. When you follow the trail from the parking lot to the South Tufa beach area, you can go to the right at the beach and keep your shoes clean. But if you go to the left, expect to get your shoes muddy this time of year. I veered a little off the trail and stepped on what looked like solid ground but I broke through the thin dry crust and ended up past my ankle in green stinky mud. Oops. 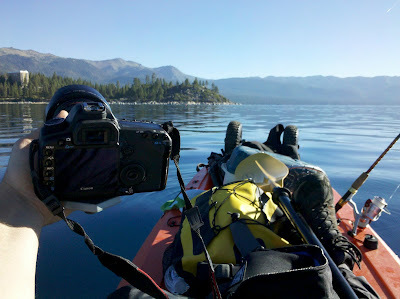 I didn't have my big camera bag with all my gear, only my Canon 5D Mark II and a 24-105 L lens. I also had my graduated neutral density filter and I saw other photographers using theirs, but I opted not to use mine. The tufa towers break the horizon too much in my opinion to use it. I also didn't use my polarizer filter but I kind of wish I had when I shot the very green water, I would have liked to cut down on the glare a bit more. I occasionally used my flash to help fill in the shadow areas of the tufas with some light and also during late sunset when the tufas would have all been silhouettes without it. I would highly recommend using a tripod out there. Most of my shots were at f22 in order to get the tufas in the foreground and background in focus. This made the exposures too long to handhold, especially at sunset. Bumping up my ISO would have helped but I prefer a low ISO when I'm planning on making large 30"x40" prints. All in all, I was very happy with my Mono Lake photo experience. Easy access, no need for my 4x4. Very unusual and bizarre subject matter. The sunset was incredibly beautiful and seemed to last a very long time. My only complaint is that I didn't get to shoot a sunrise, good excuse to go back. Here are the photos from the shoot. What are your thoughts? To view larger images, click on the "full screen" icon on the slideshow. All photos are available as stock photography and fine art prints. Did you know that Scott Shots Photography now has a fan page? It's true! 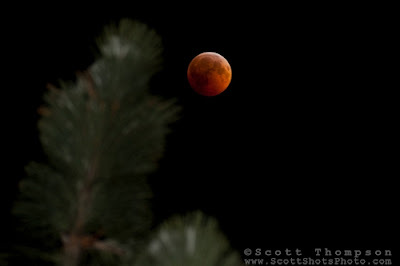 Please join me at www.facebook.com/scottshotsphotography for the latest Scott Shots news. 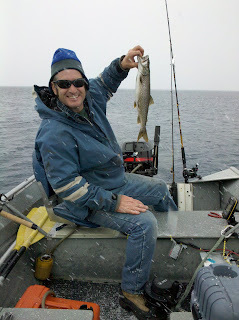 I usually post info about new photos added to my website there first. 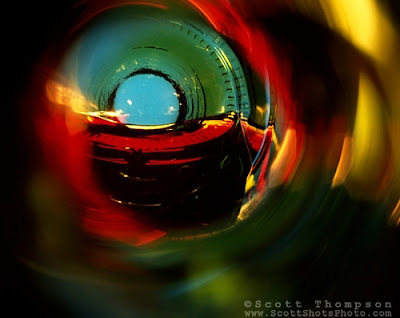 Fans can also use the coupon code FACEBOOK on the ScottShotsPhoto.com website when checking out for 10% off any one item, Fine Art Photos or Stock Photos!